Fire at enemy ships and pillage villages for big rewards in the fun new Viking Fire slot machine by Lightning Box Games! Join the Norse seafarers in this 5-reel 40-payline slot machine where Hammer Wilds and the Enemy Fire bonus round can earn you extra big wins. Land atop a green grassy knoll where an animated viking stands beside the reels to root you on. 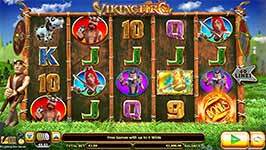 This great slot features some major Viking characters like the fierce Nordic male and female warriors, a trusty canine and a wizard who no doubt helps the vikings on their world conquering quest. The Hammer is wild in both normal and free spin mode. When you hit the free spin mode, you’ll be transported to a viking cave filled to the brim with treasures. Are you ready for your Nordic treasure hunt? Hammer Wilds – The Golden Hammer symbol is the wild and substitutes for all symbols except the scatter to complete wins. All wins that include wilds are doubled with a 2x multiplier! Scatter Bonus – Land three or more Bonus scatter icons anywhere on the reels to win instant prizes. Any scatter win will also trigger the bonus round! In the bonus round you will sink ships to reveal extra wilds and more free games. Enemy Fire Bonus Round – When you land 3, 4 or 5 scattered bonus symbols you will earn the Bonus round. Pick target ships to reveal Extra Wilds and Free games. Extras may include Wild Viking, Wild Princess, Wild Wizard, +1 free game and +2 free games. There is also an ‘X’ which you want to avoid because getting two will end the round.